LAUNCESTON, Tasmania, Australia, December 5, 2012 (ENS) – Hydro Tasmania will pull its personnel out of the Malaysian state of Sarawak by the end of 2013, the company’s chief executive promised an indigenous delegation Monday. The indigenous leaders are touring Australia to demand that the Tasmanian government corporation stop participating in Sarawak’s plans to dam most of the state’s rivers. 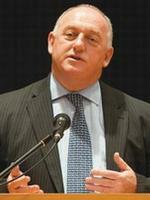 Hydro Tasmania CEO Roy Adair said in a meeting with the Sarawak campaigners on Monday that Hydro Tasmania will leave Sarawak by the end of 2013. In the meantime, they will fulfill their “remaining contractual obligations,” Adair told indigenous leaders Peter Kallang and James Nyurang from the nonprofit group Save Sarawak Rivers and Peter John Jaban from Radio Free Sarawak during their meeting in Launceston. The Sarawak state government under Chief Minister Taib Mahmud plans to dam most of the rivers in the state’s interior, with planned investments of up to US$105 billion by 2030. 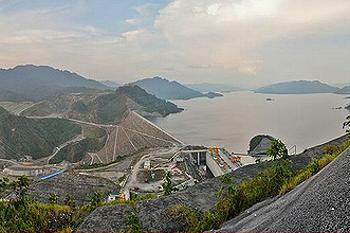 The dams constitute the core element of the so-called Sarawak Corridor of Renewable Energy, SCORE. The anti-dam campaign mounted jointly by the Sarawak coalition of NGOs Save Rivers, the Bruno Manser Fund based in Switzerland, the Australian Greens Party and the Huon Valley Environment Centre is declaring victory. 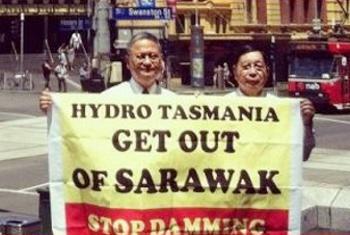 During the campaign more than 5,700 people sent emails to Adair, asking the Hydro Tasmania CEO to get out of Sarawak. “This result is a huge success and is giving Sarawak Chief Minister Taib Mahmud a big headache – the very reason why he recently accused the NGOs of ‘economic sabotage,’ said the Bruno Manser Fund in a statement today. Adair’s statement means “a significant u-turn in Hydro Tasmania’s position over the Sarawak dams” which it has been defending in recent TV broadcasts, said the Bruno Manser Fund. The campaigners are pleased that Hydro Tasmania has withdrawn Andrew Pattle, senior project manager of the nearly completed Murum dam, and former project manager for the Baram 1 and Baleh dams. As the indigenous leaders head home to Sarawak on Thursday, Hydro Tasmania officials will be before the Tasmanian Parliament in Hobart facing questions about why the company got involved in Sarawak in the first place. They will also be called to account for why international dam-building standards were not applied with the Murum dam construction, in which Hydro Tasmania staff had a key role. Adair issued a statement on Monday after the meeting in which he accuses the indigenous leaders of “misrepresentations” of Hydro Tasmania’s involvement. During the meeting Adair emphasized that Hydro Tasmania is not a key player in the Sarawak hydropower program – the SCORE program – and Hydro Tasmania is not undertaking any work on the Baram Dam. “Other consultants, including other Australian businesses, are doing more work in Sarawak and have a far greater presence and influence on the future of the project than Hydro Tasmania has ever had,” Adair said. “We urged the Sarawak visitors to air their grievances and concerns about the Baram project with SEB [Sarawak Energy Berhad] as part of the consultation process now underway that SEB states has been designed to be consistent with world’s best practice,” said Adair. “We particularly drew to the attention of the visitors the opportunity for extensive involvement and dialogue with SEB through the consultation process in order to have their concerns satisfactorily addressed,” said the Hydro Tasmania CEO. On Tuesday Australian Greens Leader Senator Christine Milne again called on Hydro Tasmania to distance itself from Sarawak Energy.